American House is a senior living network with communities in Michigan, Illinois, and Florida. Founded in 1979 in Westland, Michigan, the company has grown to more than 50 communities, becoming a leader in senior living. They offer care and services like Independent Living, Assisted Living, Memory Care, Respite Care, and Hospice Care, and are dedicated to providing quality care for seniors and their families. American House came to Media Genesis with one of their biggest project requests: a complete website redesign and rebuild. Both teams discussed their needs, wish list, and goals for the new website prior to kicking off the project. This great conversation gave both teams a clear path moving forward with the project. American House had a strict launch deadline of December 31, 2017, which kept the redesign and website build on track. The previous American House website wasn’t mobile-friendly and had an outdated design. The Content Management System (CMS) wasn’t flexible enough to allow the American House team to make edits to the website whenever they needed. 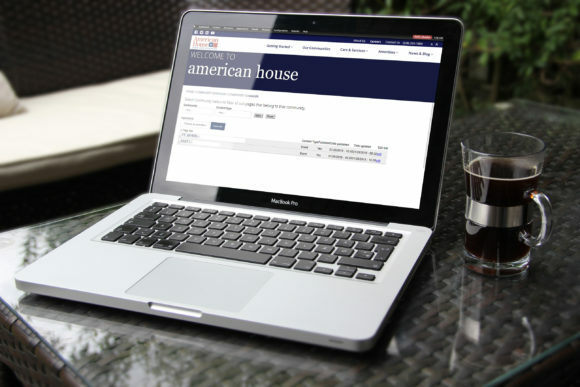 Creating a CMS that was user-friendly and easy to manage was imperative to the American House team. In addition, the previous website navigation was challenging for users. The site had two sets of navigation, one for the corporate website with general information about American House and then a completely different set of navigation for each of the 50+ communities. When a user found a community they were interested in, and then navigated to that community, the only way to get back to the main corporate site (and to search again for communities) was by clicking specific buttons on certain pages. This process caused a lot of confusion for users, so it was important that our team created a solution that gave users a seamless navigation solution to and from corporate and community pages. Our first step was to review the data and analytics with the current website for insight on what improvements could be made based on data like traffic bounce rates. We then held an Audience, Message, Action (AMA) session: an intake and brainstorming meeting with about 15 key American House stakeholders and employees. From the AMA session, we identified priority audiences for the website which gave direction for creating a truly user-friendly website experience. 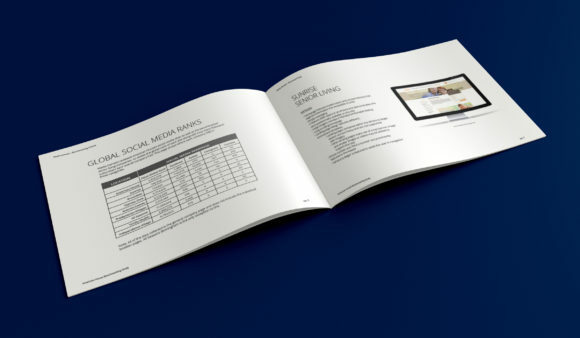 The AMA Report was presented to the American House team, containing valuable information that can be reused in other marketing initiatives and areas like social media and digital advertising. 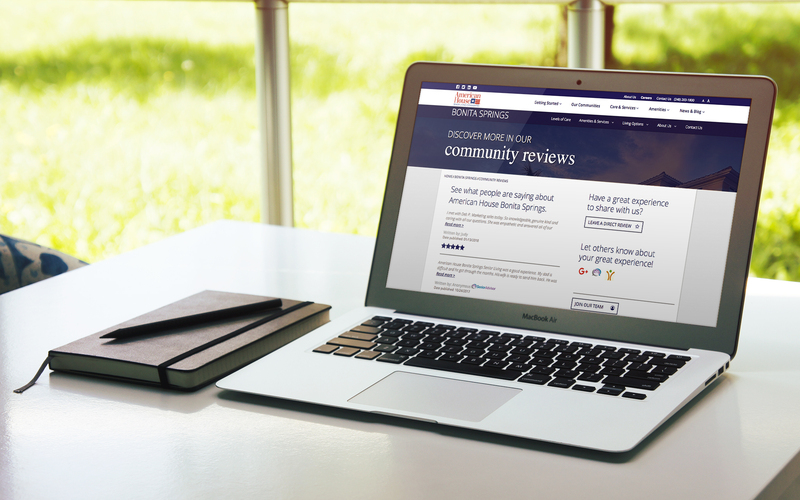 Next, we created a Benchmark Analysis Report which outlines how the previous American House website ranked within their competitors. Designers, developers, and project managers worked together to analyze details like overall experience, design, messaging, navigation, and functionality. In addition to a website Benchmark, we reviewed American House and their competitor’s social media and traffic rankings, which was compiled and presented to the American House team. Within this analysis phase of the project the team also reviewed the website’s current sitemap navigation and found ways it could be improved. Using data from their Google Analytics, we noted top content sections and landing pages, which helped develop the new sitemap. With that information, we put together our recommendations for an improved sitemap. The last step of the analysis phase was to conduct platform research and produce wireframes mockups. The project management and development teams worked together with information-gathering sessions to decide upon the best CMS platform would be best for their functionality needs as well as allow them the flexibility to edit the site as needed. We developed a spreadsheet that compared platforms’ functionalities and ability to integrate with certain plugins and modules. 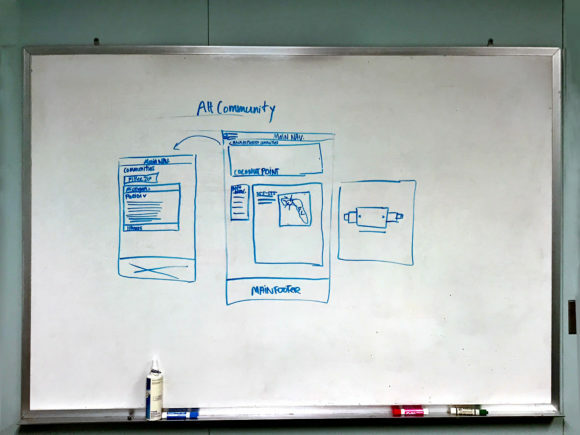 With that comprehensive guide, a CMS was chosen, and wireframing began. 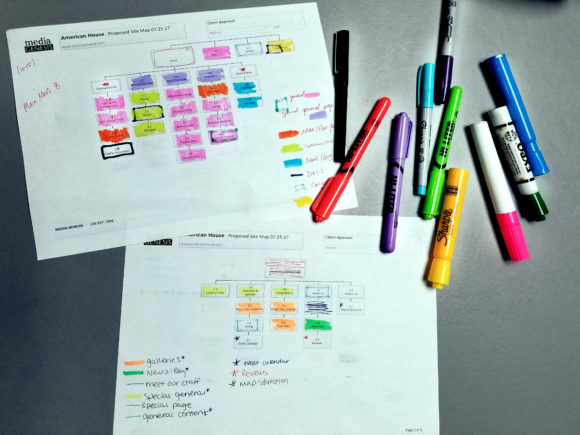 The wireframing process is the first step of towards mapping out a website before designers and developers even touch it. 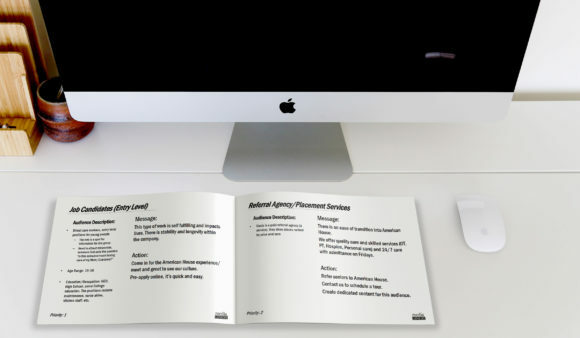 We created wireframes of the homepage and interior pages, which then served as the outline for the design team determining where navigation and content would live within the page. 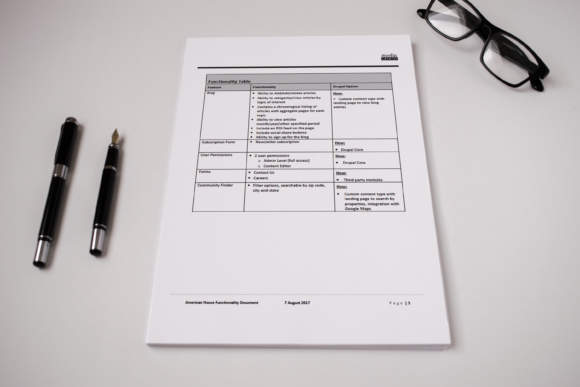 The wireframes were developed based on best practices and information gathered from the AMA, metric analysis and benchmark studies. For the American House wireframes, the project team worked with the designers sketching and brainstorming the best possible layouts. During the design phase, the project team and designers worked closely to capture the essence of the American House brand, while creating a modern, user-friendly interface for the website pages. With guidance from the sitemap and wireframe, we identified about 20 custom designs that would need to be created for the website. The team also developed a solution for the dual navigation that was needed within the corporate and community pages. Instead of hiding or removing the corporate menu when users navigated to a community page, we created a custom, two-tiered navigation system. Since the American House website is comprised of a corporate site and a microsite for each of the 50+ communities both navigations are accessible to users at all times and are clearly defined within the navigation. 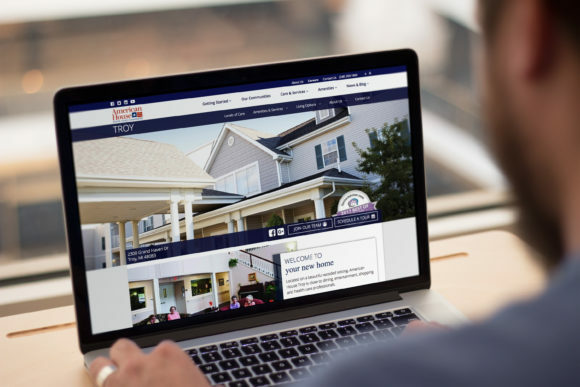 Not only did the new American House website need to have an updated look and experience for their visitors, the CMS needed to be seamless for their internal backend users. Our Drupal development team added some custom features into the website build. One example is the Community Manager Content feature. Since the site is comprised of hundreds of pages, this was added so that a website editor can search for content by specific community, content page type, or page status. Another custom feature we implemented was the auto-population and creation of community pages. The American House brand is constantly growing, and they needed an easy way to add a new community to their ever-growing network. Instead of having to manually create all the pages associated with a new community every time one is acquired, their customized Drupal database can automatically create these pages. This user-friendly feature and more efficient process makes it easier for the both teams to keep the website up-to-date. The new American House website has had early success with increased traffic, reduced bounce rate, and increased time that visitors are spending on the site. The graphic below features data comparing traffic and users during the month of January 2017 and the month of January 2018. Like everything in the digital world, things are always changing and improving. We’ll continue working with American House on phase two website improvements, website hosting, monitoring, and security updates. In addition to website upkeep our marketing team manages their Google AdWords campaign and other targeted digital marketing initiatives. Both teams will be working towards growing the American House brand and evolving their website and digital marketing as the company continues to grow.